Also, the round up proposals stated the majority of the wild horses BLM intends on removing are “occurring outside the Rock Creek HMA.” Click Here to view BLMs letter. The Rock Creek wild horse Herd Management Area (HMA) is located in Northern Nevada near the Idaho border. It is adjacent to several other wild horse HMAs including Little Humboldt, Snowstorm Mountains, Little Owyhee and Rock Creek’s closest cousin, the Owyhee HMA. This area is generally managed by BLM as a “Complex”, meaning they often issue round up proposals for several of these HMAs at once and consider the close proximity of the other HMAs as assuring the genetic diversity and stability of the herds in the area. Also, because of this “genetic interchange” (a.k.a., migrating wild horses), BLM targeted this area as a potential future candidate for returning castrated stallions (geldings) as a portion of the wild horses BLM will manage in the area in their Draft Report, “Options for Managing a Non-Breeding Component within Self-Sustaining Herds of Wild Horses” (July 2006). Since the majority of the Rock Creek HMA is surrounded by other wild horse HMAs, we are only left to wonder what BLM means by gathering and removing wild horses “outside the Rock Creek HMA”. How far is “outside” and is this BLMs way of hiding removals from the adjacent HMAs to avoid public disclosure of what they really intend to do? Generally, when BLM removes wild horses from “outside an HMA”, they usually don’t transport any of them back into the HMA with the reason given being, wild horses just go back to their “home range”, which is now located outside their legal boundaries. Also, when wild horses are taken under an “outside HMA” heading, BLM usually fails to report WHERE they took the horses from: in their post-gather reports, in the numbers they send to the National Program Office and the descriptions they provide for the now captured wild horses offered for adoption. It’s a great technique to juggle numbers, hide populations and scramble reports…. Currently, BLM is reporting 511 wild horses have been identified in the Rock Creek “area” but this number continues to defy all logic as the Rock Creek wild horses were removed in 2005 and then again in the fall of 2006 during an emergency round up due to wildfires burning “nearly 1,480 square miles”, according to Willis Lamm of Kicking Back Ranch. (Perhaps this is why wild horses are now occurring “outside the HMA” – because their former habitat has been charred to a crisp and BLM offers no other solution but removals). For an in depth review of the stark conditions that sparked the Rock Creek emergency removals in 2006, Click Here. According to BLMs 2006 Final Gather Schedule, only 52 wild horses were estimated as remaining in Rock Creek after the gathers despite a “high” established allowable management level of 250 wild horses. At that time, BLM reported it was necessary to remove so many more wild horses than normal in order to protect the range from further degradation and prevent wild horses from starving to death due to lack of forage. If you are wondering if any other wild horses were also removed during this same 2006 round up, the answer is - yes they were. BLM reported removing 247 from Rock Creek, 87 from Little Humboldt (with 25 wild horses estimated as remaining), 24 removed from Snowstorm Mountains (with an estimated 108 remaining) and 125 wild horses were removed from the Owyhee HMA (with 400 estimated as remaining). Click Here to view BLMs Final 2006 Gather Schedule and these gather statistics are located on the last page. Because of the timing of the round ups, only two foaling seasons have transpired since BLM issued the population figures cited above (though by the end of June, it will be up to three foaling seasons.) 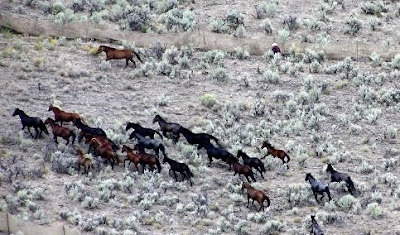 Despite this, BLM now claims that the 52 Rock Creek wild horses of three years ago have now magically turned into over 500 wild horses – and this is before this year’s foals have actually arrived AND despite the fact that foals from the previous two years were generally too young to reproduce yet themselves. However, we can be assured that BLM will blame yet again either “poor census methods” or wild horses migrating from other HMAs to explain this astonishing population explosion – just like they always do. Except the world is getting smaller and what use to occur in the vast expanses of solitary rangelands, unseen and unknown by only a few, is becoming more and more public as eyewitnesses are reporting what they find in BLMs “management areas” that just doesn’t jive with the official reports. In this case, a eyewitness account during a recent field trip of the Owyhee livestock allotment taken in early December 2008, (which encompasses most of the Owhyee wild horse HMA and is adjacent to Rock Creek) reported an “astonishing lack of wild horses in the area” or any recent signs of wild horse use at all (they only saw 3 really spooked wild horses during the entire trip). They also expressed concerns about BLM closing gates they weren’t suppose too, which could potentially entrap or exclude wild horses from much needed critical resources, as well as noting a mysterious horse corral set up in the middle of one of the grazing pastures whose purpose could not be immediately explained. The questions raised by what they saw and the detailed accounting of what they found leave no doubt that something really fishy was going on in the area at the time. Because of their concerns, shortly after returning from the area they officially submitted many questions to BLM and I have summarized this in a Field Observation Report you can view by Clicking Here. It took BLM 3 months to respond in any manner to their questions and when BLM finally did, they reported a March 2, 2009 census found 510 wild horses in much of the same area field trip observers were going through just a few months before. While I don’t have any doubt that indeed, 500 wild horses are now in the Rock Creek HMA as BLM is reporting (or in the adjacent “outside areas” – including the Owyhee HMA), the questions now become: Where were they in December? How can they now be occurring by the hundreds in just a little over two months and only after serious questions were raised about these same vast expanses being completely devoid of wild horse populations? In trying to find answers, I found a very interesting article on the Nevada Commission for the Preservation of Wild Horses website titled, "A Long Way From Home". It is the story of a rare “perlino” foal with a peach colored mane and tale, darker peach/dun color hocks and knees and frosty peach fuzz color body. He was later to be named Mister and sprung from a wild mare named Pumpkin. However, as adorable as little “Mister” was, it wasn’t his story I found so interesting but Momma Pumpkin’s story that really caught my attention. In describing Momma Pumpkin’s background, writer Jan Davis (Editor/Member of Western Writers of America) stated: “Pumpkin (91531736, signalment HF1AFAEIE) was born April of 1991 in Palomino Valley Facility (NV53F) in Washoe, Nevada. She remains a bit of a mystery horse because she shows up on the BLM records through 5/16/91 and then was unaccounted for until she showed up in the wild horse gather 2/15/02 in Rock Creek HMA Nevada….” Click Here to view the complete story. That’s right, Pumpkin was 11 years old when she was “found” in the Rock Creek HMA during a 2002 round up. So how did Pumpkin disappear from BLMs watchful eye for 11 years only to re-emerge as a “wild horse” in Rock Creek? Perhaps this can provide a clue about the mysterious horse corral the eyewitness had noticed in the middle of the Owyhee allotment pasture last December. In my research, I have now found several accounts of wild horses being dropped off in HMAs by BLM for a variety of reasons, including testimony as far back as 1998 from Dale Tunnel, head of BLMs Special Agent Law Enforcement Division (Click Here to view “The Horse Rustlers”) to the most recent report of wild horses taken from Utah’s Sulphur HMA last November and then returned to the range after being held for over a month for “fertility control treatments” as well as citing they were returned for their exceptional conformation, color and spanish mustang characteristics. Here is BLMs actual statement regarding their return – “There are 29 head of horses that will be returned to the Sulphur HMA on 01/16/09.” Click Here for BLMs Post-Gather Report (pg. 2 under Comments). While again we can only speculate as to what is really going on out on the range, what we do know for certain is – these days, BLM has a lot riding on the line in the Wild Horse & Burro Program…. Somehow they must convince Congress that their management of the Wild Horse & Burro Program is reasonably well grounded in legitimate data while simultaneously convincing them that the scores of testimony, evidence and proof showing their utter lack of knowledge, abysmal failures in population reporting and general mismanagement (with some of this testimony coming from BLM themselves), is only to be considered when things aren’t “adding up”. Any other time, they assure us they completely know what they are doing. However, setting aside all the speculation as to “how” all these wild horses mysteriously keep being found in the HMAs shortly after huge removal operations, what I can say with absolute certainty is, by the time the round ups are conducted, the wild horses really are there and this brings me to my immediate concern. According to a fellow wild horse advocate, Barbara Warner from American Horse Defense Fund, recent communications with the BLM Elko Field Office has them on record stating they are going to postpone the Rock Creek round up until the fall of 2010. While all round up postponements are usually cause for relief (ESPECIALLY THESE DAYS! ), in this instance, I’m very worried about the wild horses themselves. If hundreds of wild horses are now out on the range as BLM is reporting, there is NOT sufficient forage and water to support them – period, the end. With such past tragedies as the known deaths of the Jackson Mountain wild horses and recently, “large numbers of dead horses” found on the range in Oregon during a round up last fall, there is the very real possibility that when summer hits, these horses are going to struggle, starve and die because there is just too many of them for the range to support in its current condition. Is BLM planning on letting them just sit out there and starve to death to get their photos to show Congress WHY they need funding and to continue round ups? Will these wild horses be martyred to show waterholes beaten to a pulp to illustrate the continued “severe overpopulation of wild horses” used to justify BLMs ongoing actions? From here, will BLM then blame wild horse advocates for being an impediment to their “sound rangeland management” just as Advisory Board Member Dr. Spratling did after the Jackson Mountain fiasco when he exclaimed, “The very people that claim to care the most about those horses were actually the ones driving the death nail in their coffin”. Or will BLM finally find their hearts at the last minute and sweep in to do yet another “emergency” round up to save them from this fate, (which they unequivocally know is coming) while conveniently circumventing any further public notice, deny the public opportunity to comment or provide input (such as stacking the herd with mostly mares and then giving them PZP to compensate) as well as using this move to prevent any opportunity for the public to legally appeal their actions such as they did with the Nellis wild horses last summer. BLM knows their actions cannot be publicly appealed to the Interior Board of Land of Appeals if no signature is provided to authorize their actions – they get around this lack of signature by giving a “verbal order” that the court does not recognize – even if BLM then submits evidence of their actions to the court after the fact. So, while BLM is still “legally accepting public input”, I would like to highly recommend the public ask them a few questions about what is REALLY going on in the Rock Creek HMA and the surrounding areas. Additionally, since BLM has reportedly cancelled the round up, what do they plan to do about hundreds and hundreds of now present wild horses trying to survive on drought and fire stricken ranges and are pasture fences closed throughout this area like they were in the Owyhee allotment last December. Please be aware that any personal information and comments submitted to BLM become part of the public record. If requested, BLM will try to withhold personally identifying information but cannot guarantee this. Also, be sure to include Rock Creek Wild Horse Gather Scoping Notice in the title of your comments. "You may be aware that the BLM’s inability to administer the budget of the Wild Horse and Burro Program with any trace of fiscal accountability is a long-standing concern…." Alright everybody, bear with me on this one as I’m going to jump around quite a bit here and cover a lot of ground…. So Ted’s reminiscing about the good ole days when Don Young was around reminded me of a government contract I meant to check out quite some time ago but somehow got pushed to the back of my ever expanding pile of projects. It was a contract awarded through the Department of the Interior (DOI) for “Wild Horse & Burro Control Services” (Product Code F016) signed on September 7, 2007 and was good through 2008. $10,000 dollars was awarded to the Friends of Alaska National Wildlife Refuges, A Cooperative Corporation based in Anchorage and funneled through U.S. Fish & Wildlife (USFWS). Click Here to view. Needless to say, I wondered what Alaska needed money for to control wild horses and burros. Well, it turns out the $10k contract went to Don Young’s district in an non-competed and unsolicited bid because of its “unique services” for an organization just three years old - and that’s three years old as of this year. It was comprised of four people with an annual reported income of merely $12,000 when the contract was awarded and touts a recent membership tally of 210, members who apparently specialize in a "war on invasive species”. According to the “Friends of Alaska” newsletters, they are very tight with USFWS because of their involvement with the Wildlife Refuge System. On the back page of their recently released 2008-2009 Winter Newsletter, they list all the projects they were involved in for 2008, which just happens to include “Unalaska Non-Native Horse Gelding Project”. So as I pondered this funding curve to the Friends, this led me to thinking about the budget BLM presented to the National Wild Horse and Burro Advisory Board in February 2008 reproduced in the 6/24/08 post, “BLM Budgets”. Click Here to view. So in trying to get an idea of just how much money was being omitted from the credit side of the Wild Horse & Burro Program, I did some quick math, (which is included in the Mustang & Burro Report, pg. 35) and found this would amount to almost $600,000 for the 4,772 animals adopted in Fiscal Year 2007 at $125.00 each. Though I can attest to the fact that I’ve seen many wild horses go for much higher than this on BLM’s Internet Adoption Website, this base figure should be reasonably solid. Well, I don’t know about you but I consider six hundred thousand dollars no small chunk of change and certainly not small enough for BLM to fail to report it to the Advisory Board, ESPECIALLY since the entire crux of killing 33,000 wild horses and burros is based on funding issues. After all, BLM reported the cost of the Adoption Program, why didn’t they report the revenue it generated? So then my mind wanders to what Congressmen Rahall and Grijalva stated in their letter last year as quoted above about how BLM is notorious for not having a “trace of fiscal accountability” in the WH&B Program. Well, as rewarding as it was finding all those old articles, Google couldn’t find any recent financial audit of the WH&B Program so I contacted various wild horse advocates and they weren’t aware of a recent financial audit either. So out comes the October 2008 Government Accountability Office (GAO) Report to see if they had any significant financial information or requests for an audit of the Wild Horse & Burro Program. Not surprisingly, just like all the other information this “Slaughter-On-A-Silver-Platter” report produced, the financial information is just regurgitated budgets, projections and numbers spoon fed to the GAO by BLM. *BLM was suppose to have a report out in March 2009 providing a breakdown of all the acreage in the Wild Horse & Burro Program and why it was zeroed out, a report that hasn’t materialized yet. *BLM was also suppose to release their National Policy Handbook on the Wild Horse & Burro Program by March 2009 to establish consistency with how our mustangs and burros are determined “excessive”, which hasn’t been published yet either (though I’ve been assured that Susie “Sunshine” Stokke is diligently working to crank out the very best policies her oversight has to offer). By the by, BLM has confirmed that when this National Handbook is finally produced, it will be open to comment and input from the Advisory Board but NOT TO THE PUBLIC, despite it probably being the most significant document to oversee every detail of on-the-ground management affecting the entire Program, all remaining habitat and every herd still standing. My guess is this little piece of unofficial legislation will weigh in HUGE on the Program for the rest of its days but no, the public is not allowed to participate in something that might really matter in how our wild herds will be managed, protected and preserved. *The GAO actually had the audacity to regurgitate, “According to BLM data, the population now exceeds the upper limit of AML by an estimated 5,886 animals. BLM attributes most of the increase in population to more accurate population census counts” (pg. 32). How in good conscience could the GAO just throw this out there without challenge, without question, without proof? Is anyone else aware of BLM implementing nationwide changes in how they counted our mustangs and burros on the range, a technique they used all across the West prior to the release of the GAO report to justify this completely unfounded statement? So what gives? While the rest of the GAO report beats the drum of how the current method is flawed and has ONLY been under counting populations, as far as I know THIS IS THE SAME METHOD BLM used to justify how they “found” 5,886 more animals nationally. Did BLM discover some amazingly superior technique and secretly conducted a national census all across the West with no one knowing about it right before the GAO released their report? And how exactly was this national census funded – with more donations to Friends of Alaska or others like them? WHERE’S A REAL FINANCIAL AUDIT OF THE WILD HORSE & BURRO PROGRAM? At the Wild Horse & Burro Summit last October, BLM Deputy Director Henri Bisson told a packed room that, at the very latest, BLM would give our wild horses and burros until the end of Fiscal Year 2009 (that’s September 30th of this year folks - just a measly three months away) to find solutions to their budget problems or they would be forced to take “drastic measures”. Drastic measures based on a “budget” we have never seen for “excessive” wild horses and burros that keep materializing - from where? Photo of wild horses being removed in 2006 from the now zeroed out Ely District. On April 10, 2008, BLM released an updated Fact Sheet on the Wild Horse & Burro Program, which included a national population estimate of 29,000 wild horses and burros as of February 28, 2007. (The population cited in the National Herd Statistics was actually 28,563). By June, BLM released a new national population estimate of 33,105 wild horses and burros as of February 28, 2008 according to their National Herd Statistics data. As of May 1, 2009, BLM now estimates over 36,000 wild horses and burros are still roaming free on the range as of February 28, 2009. So let’s follow the numbers since their February 28, 2007 report to see how BLM arrived at their newest estimate of over 36,000. Note: BLM does not remove wild horses between 3/01 and 6/30 to allow for foaling season. Yet instead of reporting wild horse and burro populations totaling 27,168 as of 3/01/08, BLM instead reported 33,105 wild horses and burros still remained on the range, almost 6,000 more than a 20% reproduction rate and their removal numbers could actually support. So based on this almost 6,000 wild horse and burro “magical” increase, what happened to this year’s numbers? So what would national wild horse and burro populations look like if that extra 6,000 wasn’t added to the national populations back in February 2008? Let’s look at an Alternative national wild horse and burro population estimate based on what should have been left on 2/28/08 instead of what BLM reported with the almost 6,000 extra wild horses and burros. By adding the almost 6,000 extra wild horses and burros to the February 28, 2008 national population estimate and at least an additional 1,000 more this year, BLM is reporting a national estimate of over 8,300 wild horses and burros than their previous reports can support. And this pattern goes back all the way to 2001…..
Is anybody else doing the math or asking questions about this or am I the only one? By the way, the National Allowable Management Level for wild horses and burros has dropped yet again, down from 27,219 in 2008 to an approximate 26,600 based on the May 1, 2009 BLM Fact Sheet. 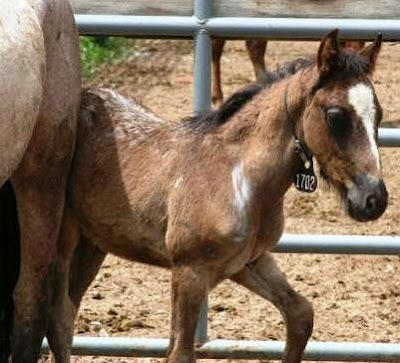 Wild horse born in BLM holding facility taken from BLM Internet Adoption Site. "As someone who has photographed the same herd for the past few years, I'm pleading that you look into the records. Something isn't right. Southern Oregon BLM shows that there are approximately 1,000 wild horses in the various herds spread over many areas. Yet, local ranchers that pay for their cattle to SHARE the area with the horses claim that the numbers are higher than what I have seen with my eyes. The horses are restricted to particular areas, and blocked in by fences. When the food gets scarce, and the water gets low, the ranchers pull their cattle out, and the horses are left with next to nothing. WHAT IS WRONG WITH THIS PICTURE?" In response to the GAO recommendations, BLM began publishing monthly statistics of public interest, which included adoptions, sales, short and long term holding numbers as well as the number of wild horses and burros removed during the round ups. When I first discovered BLM was finally taking this step in the right direction, I loudly applauded their efforts - but my elation was quickly dampened and here’s why. To go back a little in time, since discovering BLM published Post-Gather Reports after each round up, I have routinely requested copies of these reports for well over 2 years now. However, when I requested a copy of the Post-Gather Report for Utah's Sulphur wild horses conducted last November, BLM WH&B State Lead Gus Warr politely responded that sending them to the National Program Office would be a top priority so they could be posted on BLM’s website - but no, I wasn’t going to get a copy of the report – at least, not from him. (Note: This was implied since he never included the report nor did I receive any further communications from him). This led to questions with the National Program Office about whether BLM would continue to supply the public with these valuable reports and that is how I discovered a change in policy had been made. Specifically, I was asked to no longer contact any WH&B Specialist, Field Office or State WH&B Lead with any future requests for Post-Gather Reports though BLM stated they would be happy to continue to provide them via a contact from the National Program Office instead. So began the several month trek to acquire documents that use to only take a few weeks - still, BLM finally made good on their promise and the post-gather reports arrived! Though BLM posting a few more statistics on the Wild Horse & Burro website helps create the illusion of BLM’s compliance with recommendations to increase their transparency, in my opinion, they immediately seized the opportunity to yet again circumvent the very intent of WHY there continues to be long standing public concerns about what is REALLY going on behind the scenes. But back to the Post-Gather Reports….. In a recent email exchange with a fellow horse advocate, they recommended I shorten my articles and try to be more optimistic about the WH&B Program. I have been reflecting on their words and admit, the darkness I have found myself engulfed in since I began to discover what has been going on behind the scenes of wild horse and burro “protection” (and horse slaughter for that matter), has taken its toll on my spirit. So, I’m going to try something new. Since I can’t really find it in me at the moment to be more optimistic about the future of America’s Mustangs & Burros since “Burns-Amendment-Co-Sponsor” Senator Harry Reid recently gave his nod of approval towards “Wild-Horse-And-Burro-Cleansing-Campaign-General” Bob Abbey for his choice as the next National Director for BLM, (Mr. Abbey is the ex-BLM Director for Nevada who went to Congress with “The Plan” for our wild horses and burros that has now threatened their very lives), I am going to reach back to a happier time when ignorance was bliss to present the next story, a time when I was able to easily smile at the days events – unlike now. “Large numbers of dead horses were observed in certain areas of both HMAs where the emergency gather operations were taking place. Most probably died due to lack of adequate water and forage. Most carcasses appeared to be from one to four months old….” Pg. 6.